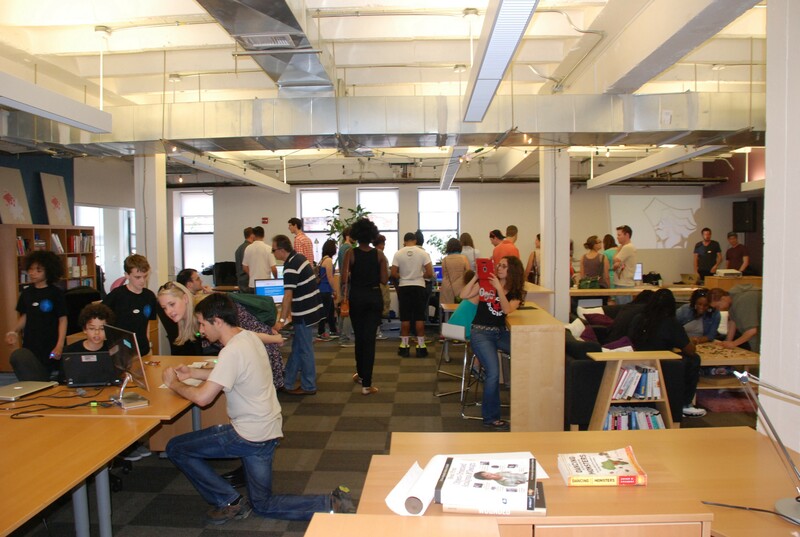 So You Think You Want to Run a Hackathon? Think Again. “Hackathons.” That’s one of the most popular answers to a question you haven’t asked yet: How do you organize your local tech community to do X/attend Y/engage with Z? For several years now, hackathons — gatherings of programmers (and, sometimes, issue-area practitioners) for deep dives into particular data-sets, problems, or concepts — have been deployed like flytraps, tenuously designed to attract and entertain developers so that “tech” could be tied to this or that event, with extra cool points assigned for maximizing opportunities for free labor and “community building”. But hackathons (and their kin, code nights) aren't the only way to attract and engage your local tech community — particularly when it comes to civic tech. Crafting high-quality civic technology — projects and tools designed with social impact in mind — requires thought, creativity, and intentionality — the strength to ask, “Will this project actually have social impact? Is it being designed for the social/cultural/political context in which it will be implemented? And if not, what steps do we need to take and what people do we need to substantially involve to get there?” Our approach to community-building in the name of civic tech should be the same. 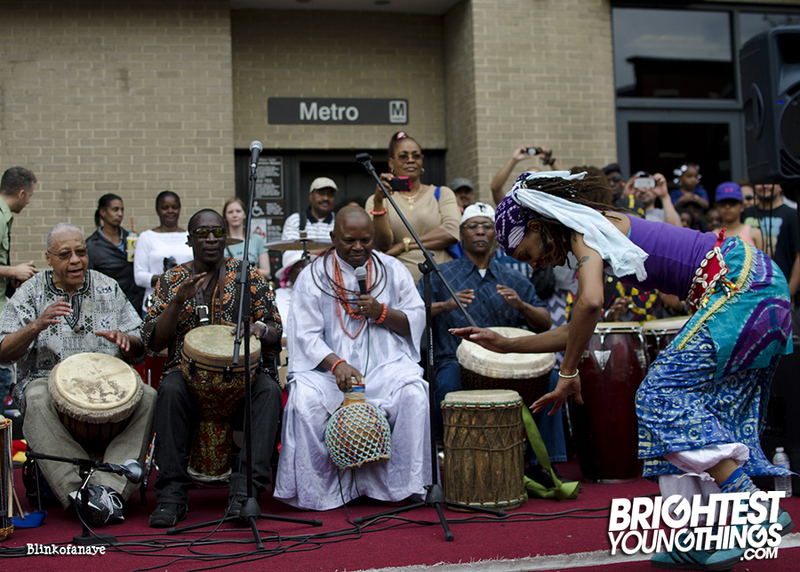 May 3, 2014: The Funk Parade takes over Washington, DC. Not all hackathons are terrible, ill-deployed “flytraps” laid out to capture developers’ attention. Initially, hacks were designed as temporary spaces for group problem-solving and prototyping (think: business accelerator meets science lab) and sometimes, just for straight-up creativity (think: 48 Hour Film projects). These kinds of hacks still happen, and when focused — like this incredible tiny hackathon that helped the city of Washington, DC radically open up its legal code—they can be wildly effective platforms for production and (despite earlier grumbles) for community building — in-group community building. At hackathons, people who speak the same language (i.e. Python, Ruby, GIS) or who care about the same issues (elections, transparency, their city) can quickly collaborate, form bonds, and share skills. In this way, hacks are not only useful iteration spaces, but also play the role of solidifiers for those parts of your tech community with technical commonalities—those that code or see code’s value. But what about the rest of your tech community? What happens when we scale the definition of “tech” beyond command lines? When we scale “the community” beyond tech creators? 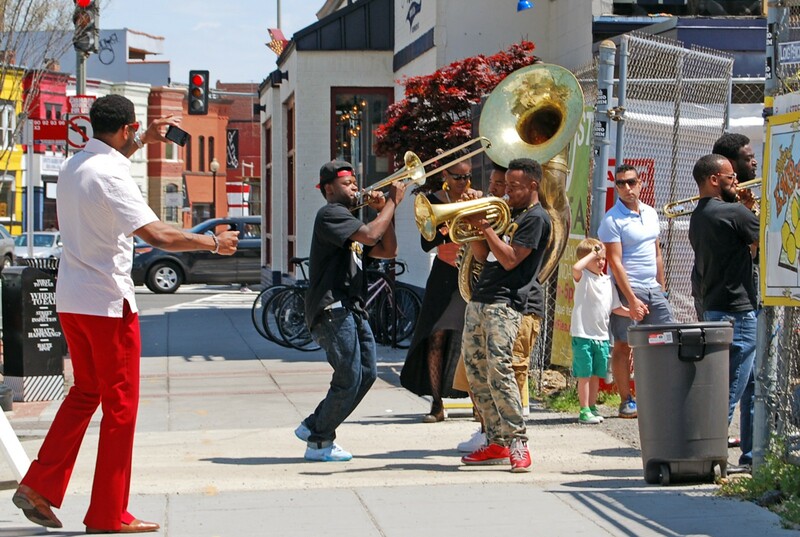 Earlier this year (before my time at the Open Technology Institute), I was approached by the organizers of DC’s first-ever Funk Parade — a street fair, foot parade, and music festival celebrating Washington, DC — to integrate the local tech community into the main event. Beyond the never-realized Robot Dance Competition (where one could either compete with a robot or do The Robot — come on, comedy gold) and The Tech Embassy (which I’ll get to in a minute), the initial scope of the work included (drumroll!) a hackathon. Now, there was most certainly a world where, with the right combination of available data, tools, creativity, and time, we could have pulled together a pretty well-organized hack related to local music with a bunch of technologists and maybe some musicians, but that world was not this one. Besides a number of small design challenges (such as limited time to organize and lack of focus), our organizing team was stuck chewing on an important question: Who would a Funk Parade hackathon be for? 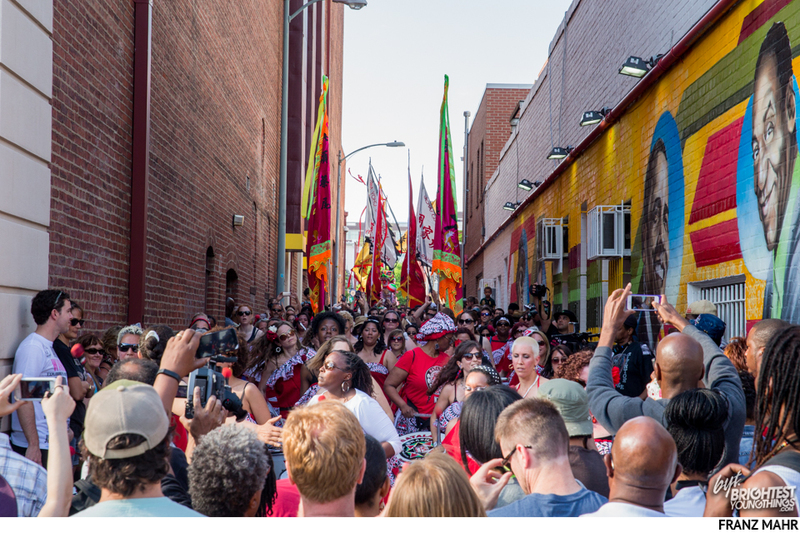 Most of Funk Parade’s programming was about building bridges — between black and white, old and young, geographic divisions in the city, you name it. 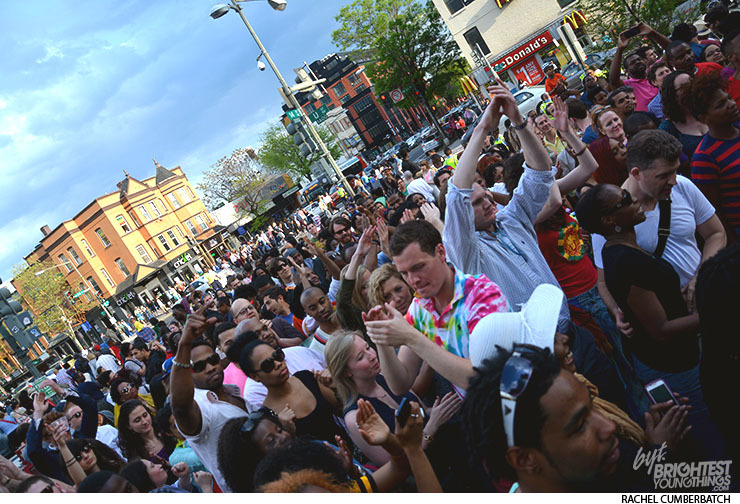 Could a Funk Parade hackathon function the same way and provide a bridge between DC’s tech scene and “the rest” of our local culture? Or, put another way: Was a hackathon the right vehicle to execute on the Funk Parade vision of unified community? Many hackathons — particularly in the civic tech space — are open to (if not craving for) non-technologists, but that doesn't make them level playing fields. First-timers at hackathons face a learning curve (“what is a hackathon”, “what can I contribute”), and most require a certain intensity of time and focus from participants that wouldn't be a great match for the feel and flow of Funk’s other programming — a booming street fair with ongoing street performances, art installations, and other kinds of movement and mischief. If we were going to create a centralized hub of activity for local tech, we wanted to build a space that fit right into the mix. This was happening literally right outside The Tech Embassy for the entire afternoon. Could you resist checking it out? Photo by William McCann. Low barrier to entry: Attendees should be able to walk in, figure out what’s happening, and be able to quickly find a way to be involved (whatever their threshold for involvement). Pro-amateur and pro-expert: Attractive to attendees of different technology skills (where “different” = skill diversity — robotics! Rails! avid Facebooking!) and skill levels. Easy to stay, easy to leave: No one should feel trapped inside all afternoon with a Funk Parade going on! Or friends to visit, kids to watch, laundry to do, etc. Focused on “civic tech” in the broadest sense — any/all projects, tools, and tricks anchored in the social and political life of our neighbors. 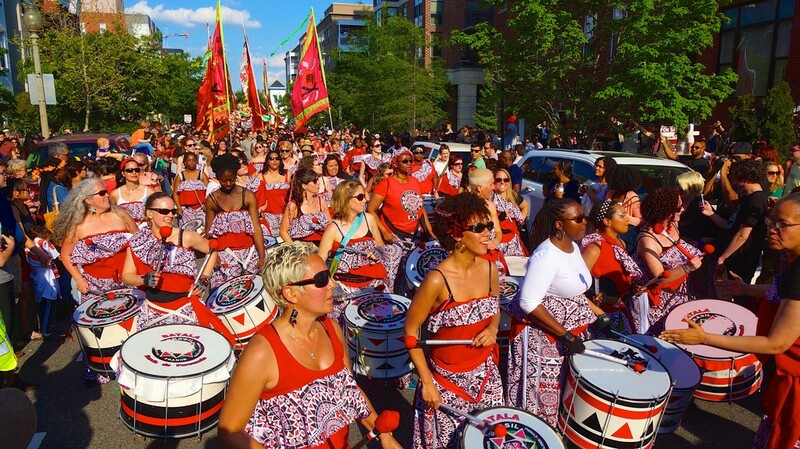 If nothing else, projects centered on improving, enjoying, and exploring the place we live would be something where 99% of Funk Parade attendees could find a piece of common ground. You can run through the criteria above and still end up deciding a hackathon would be the best fit. We almost did. But when we started sketching out the “who” that we wanted to respond and feel invited by the event we were crafting based on our criteria, the event itself changed. 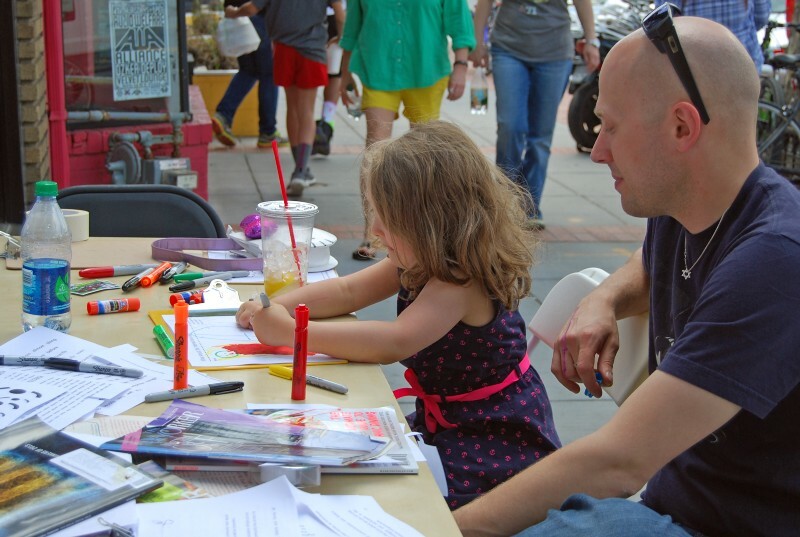 Our “who” was two-fold: (1) technologists, geeks, nerds, makers, and other signifiers of the technically inclined and, more broadly, (2) DC-ers (age 2 to 92) out enjoying their Saturday afternoons. The model we ended up with we called The Tech Embassy, a pop-up, hands-on science fair for DC tech and art made by residents for residents. 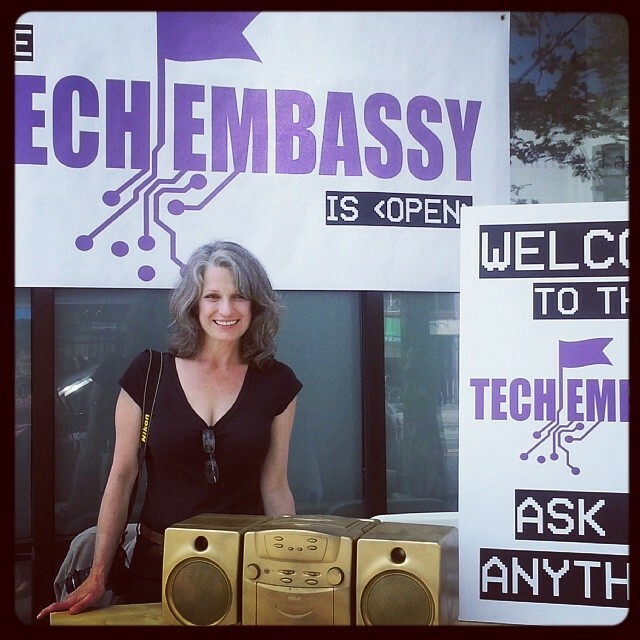 The Tech Embassy welcome table . Photo by Laurenellen McCann. The Tech Embassy was embedded within Affinity Lab, a local co-working space along the main strip of the street fair. The name was a play on the struggle we ourselves were having, defining a somewhat arbitrary line between the “tech community” and “the rest” of DC. 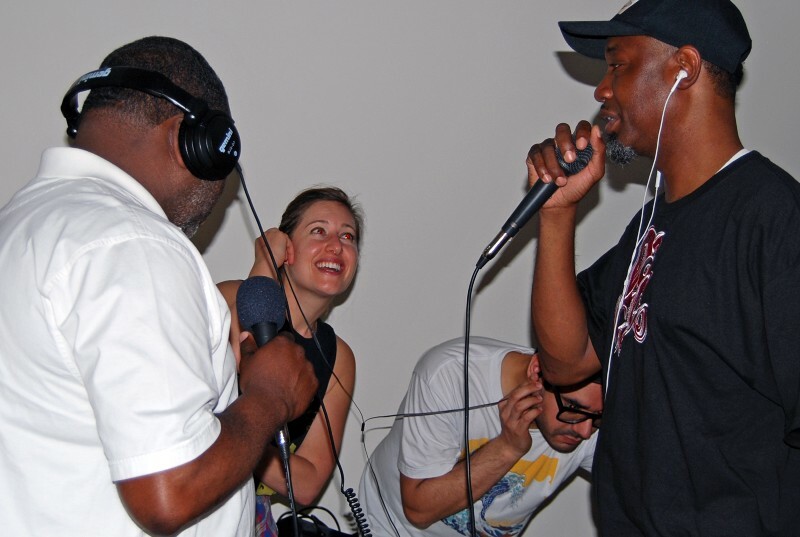 Rather than continuing to ignore this tension, we saw “The Tech Embassy” as a chance to confront it and begin to address the need to integrate and collaborate as one within DC’s broader culture. …to explore projects from local civic hackers like Code for DC, Code for Progress, and tweens from Capitol Hill Montessori School (seriously, check out their project), to reimagine tech with the Open Technology Institute (more about that here) and doodle on a graffiti wall, to play Scrabble, make over 100 LED throwies (DIY light art), learn how to 3D print with DC Public Library, dance to funk music from local DJs, learn the history of go-go music (a native DC genre of funk), and share memories of live local music for a new cultural data project. 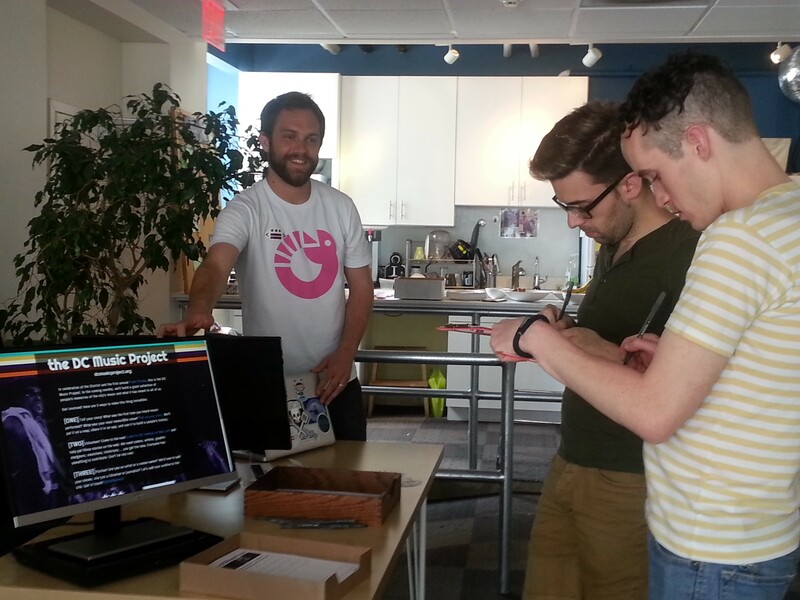 Local civic hackers from Code for DC collected cultural data for the DC Music Project without laying a hand on a keyboard. 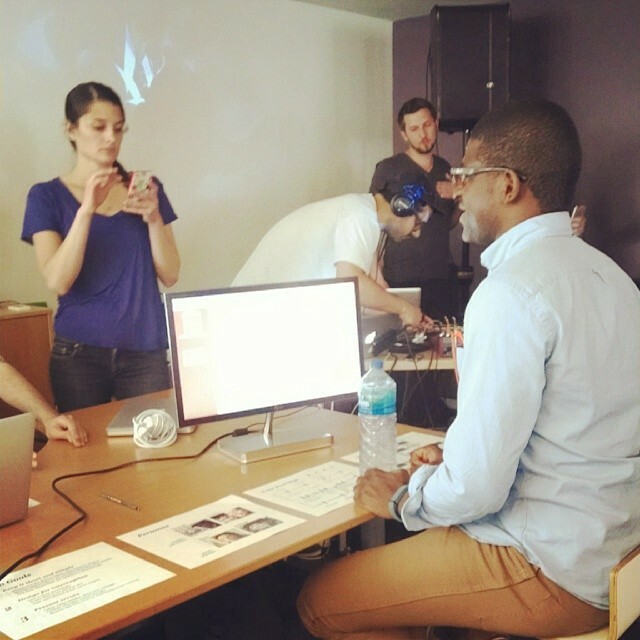 So, how did we go from a hackathon to a collaborative science fair? The structure was a natural outgrowth of other inclusive, participant-led organizing models, like unconferences — conferences designed and led by the people who show up to attend. 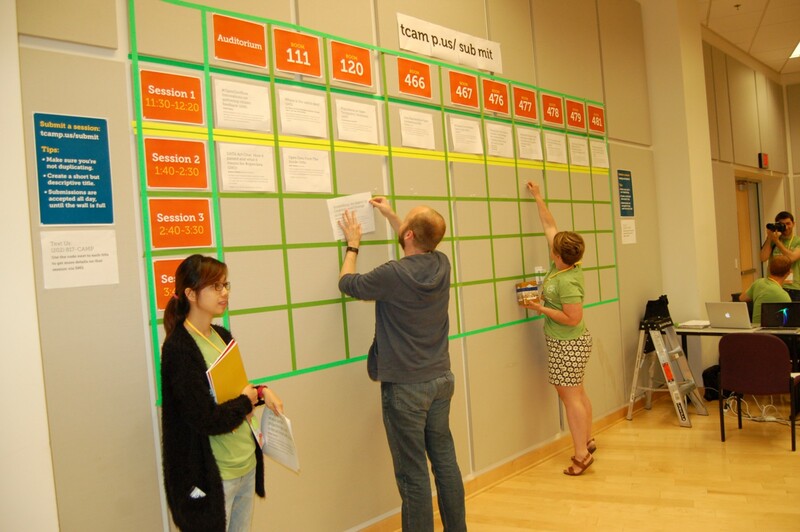 At an unconference, attendees not only lead all the sessions, they literally set the agenda (called “The Wall”). 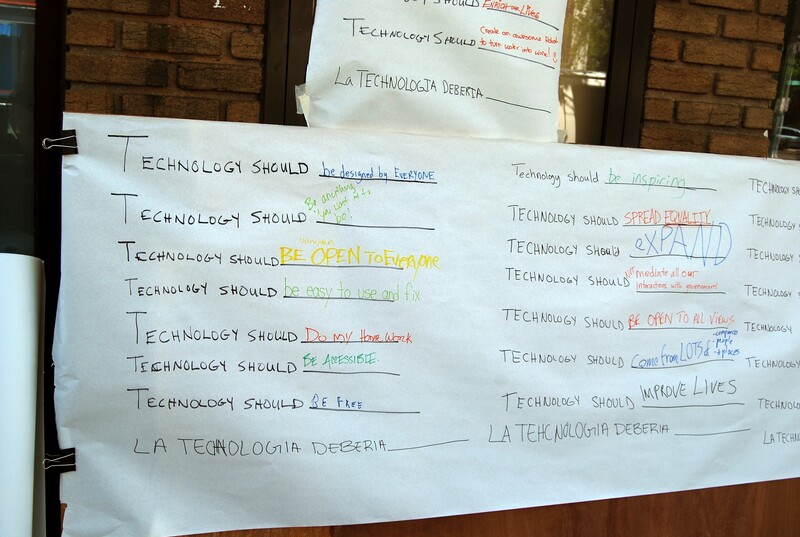 Setting The Wall (the agenda) on-site at TransparencyCamp 2014, an unconference about open government. Photo by the Sunlight Foundation. Sorta bottom-up, definitely horizontal: Putting attendees on equal footing isn't about tearing down experts or ego-boosting everyone into inflated expertise. It’s about creating structures where people can work on an equal plane, following their comfort zones and engaging with each other with diminished worry about status. This requires combining elements from the top and bottom of vertical structures that people understand. In the case of an unconference, that means stealing the top-down element of having an agenda with bottom-up element of DIY variation (such as the power to hold your own session — or don’t and hang out in the hallway all day). Horizontal structures also relate to the role played by the event organizer, something we explore more in Part 5. Freedom of movement: Don’t like a session? Leave. Want to hold a meeting outside the venue in a park? Do it. 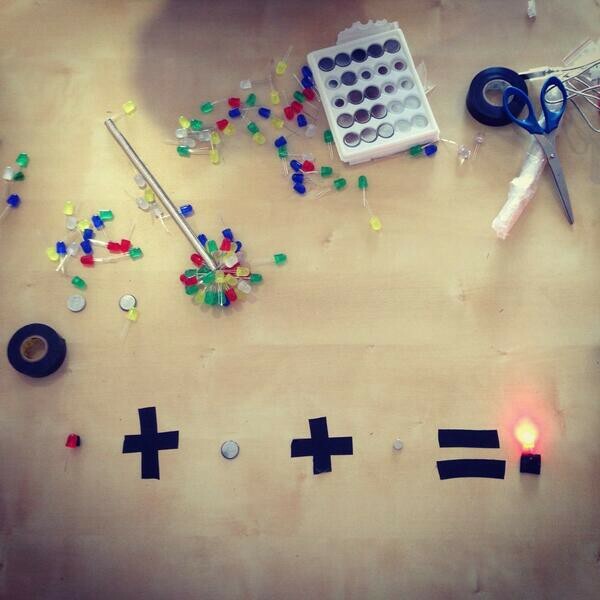 Inspired to start collaboratively hacking or co-authoring on a project right then and there? The time and space are yours. You don’t have to do anything more than be respectful to be part of the event. Although we drew heavily from these and other attributes of unconferences, we knew that we didn't want to actually organize an unconference, because even a horizontal structure of sessions and workshops wouldn't be a perfect fit for our first criterion (maintaining a low barrier to entry) in the context of the Funk Parade. Unconferences have their own learning curve. Even though they encourage free movement, like hackathons the greatest community-building benefits of this event style come from continuity: You might take your session outside to a park rather than holding it in the provided classroom, but you’re still operating in the context of the unconference. 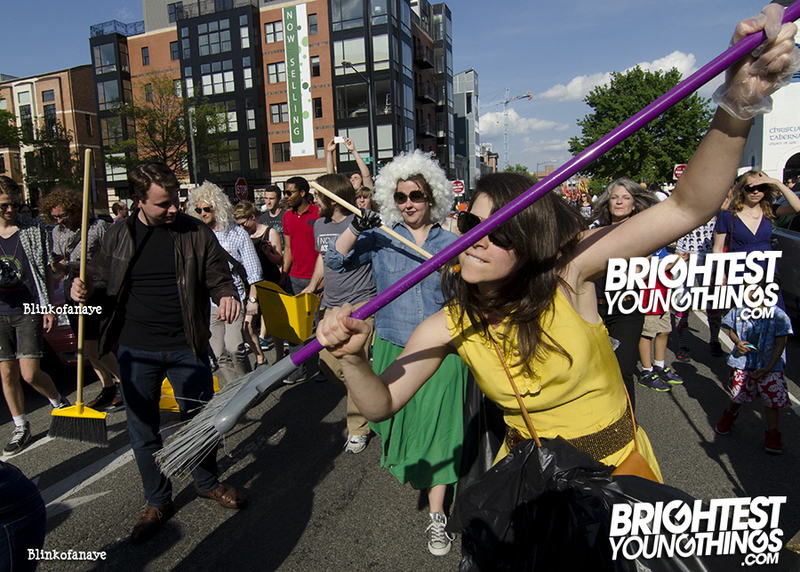 Tucked inside the greater Funk Parade, with street traffic and noise galore, we couldn’t demand that kind continuity without violating our third criterion: easy to stay, easy to leave. The Open Technology Institute’s People Tech table at The Tech Embassy invited participants to visualize both what technology looks like and what it *should* look like. 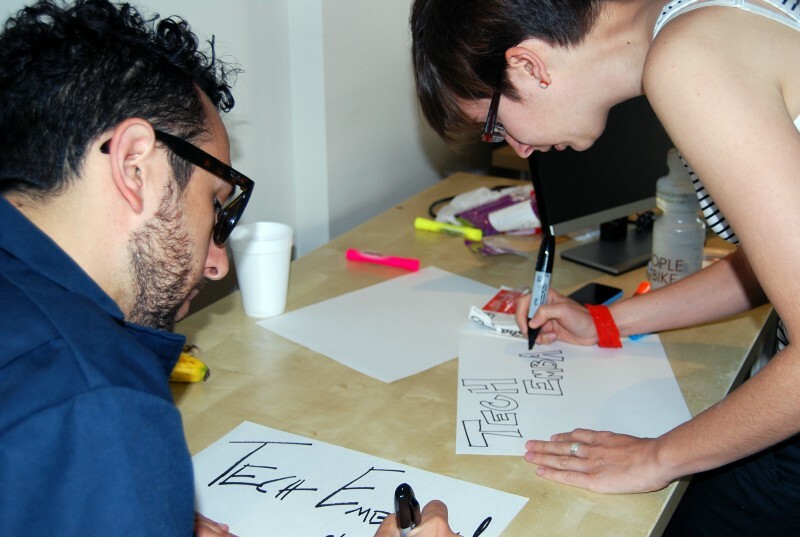 Seeking a model that was inclusive and fluid like an unconference and cooperative like a hackathon, but with more commonly understood “rules” for participation, we settled on a variation of a science fair. 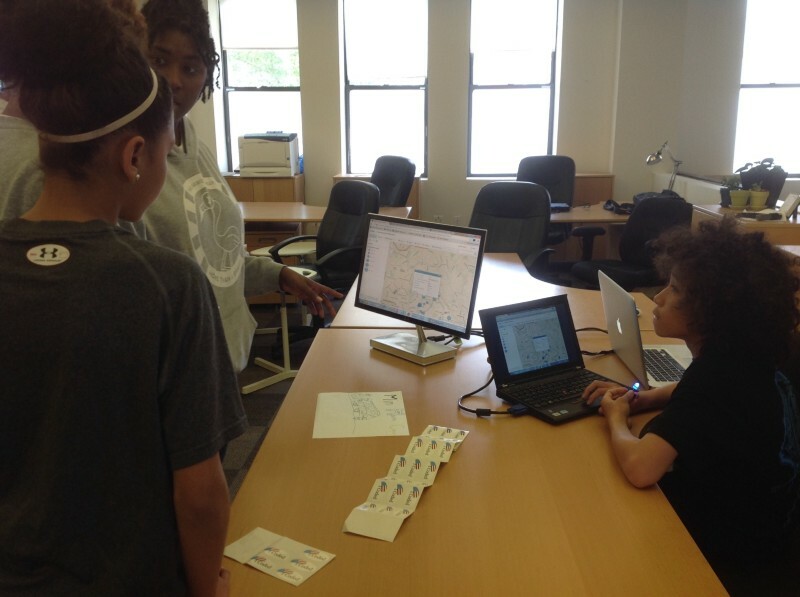 A tween hacker shares a map of homeless student resources he helped to create at The Tech Embassy. Photo by Sandra Moscoso Mills. Visitors to science fairs know the deal: You move around multiple stations, each introducing a new concept, sometimes around a theme, and you can choose which you want to visit and dig further into by engaging with the presenter (or not). That’s the part we modified: Rather than a one-way learning channel with presenters and presentees, we made our stations interactive. Some were skillshares; others took you under the hood to look at and play with code; still others were open-ended, providing opportunities to contribute data, be a maker, and/or engage with local policy referendums. But even as we designed the stations to be interactive demos and co-learning experiences, we knew that if we stuck too closely to the traditional science fair, we’d end up with a pretty dry, edutainment-y environment — not a great draw for passersby nor a match for our Funk Parade context or our goal to keep it interesting for techies, too. So, we shook things up and purposefully incorporated a number of different arts and media into our content and design. 1. Arts can radically alter an atmosphere. The LEGO table at The Tech Embassy got some serious love from adults and kids alike. Photo by Sandra Moscoso Mills. The ideal environment for community-building is one that lets people self-select their level of interaction without forcing them into high contact with strangers or letting them fall through the cracks. To capture this actively welcoming, but easy-going vibe at The Tech Embassy, we made the “Technology Should…” graffiti wall the first station anyone encountered (sending a clear signal that this space sees tech through an unusual, but open perspective; an invitation to explore), included local DJs to spin funk and dance music (with a laser show!) so feet could keep tapping/moving through the space, and we left games, like Scrabble, cards, and LEGOs, scattered on non-programming tables near couches so that people would feel free to linger—or just take a time out. Is this visitor to The Tech Embassy too young to answer “What should the Internet look like?” Photo by Maureen McCann. Not everyone learns, teaches, or collaborates in the same way. Having a variety of visual, storytelling, and tactile activities (in addition to standard conversationals) allowed us to act like an unconference and let a greater number of people have the chance to participate, dig into different subjects, and even show off their own expertise in whatever media best suited their communication style. 3. Art is not divorced from technology. 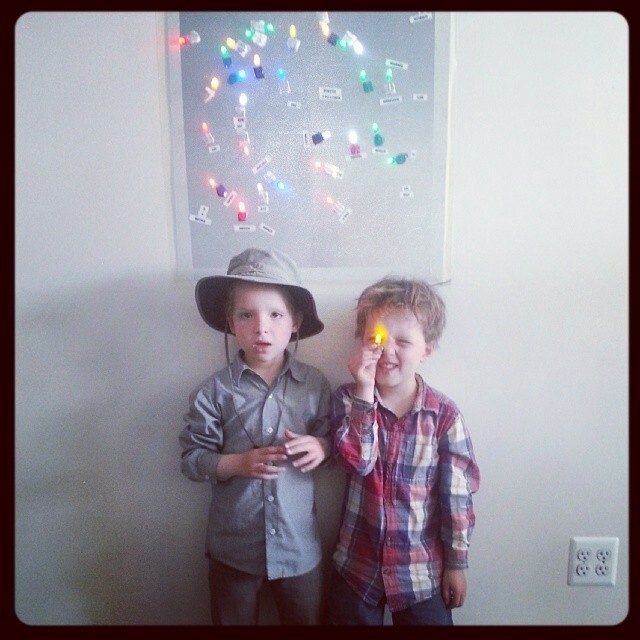 Recipe for DIY light art: combine one LED light bulb, one battery, one magnet, and a smidgen of tape. Photo by Affinity Lab. The creative arts are sometimes socially stigmatized as frivolous or as distractions from “serious” stuff. (Think: politics, business, etc.) But in addition to providing individuals with alternative avenues for engaging with information, exploring the gray space between technology and art can be informative—and inspirational—for tech’s potential impact. When thought of as a variety of methods for creation and expression, art becomes essential for understanding how technology is created (as any designer will tell you) and how it could be created (as any frustrated user will tell you — if you ask). Further, thinking of art alongside technology can help frame what additional technologies (beyond web and mobile apps) “count” when it comes to civic tech. That’s how a maker station filled with LED lights and DC Public Library’s 3D printer made their way into a space mostly dominated by software applications. In this corner of The Tech Embassy: Live-coding maps and civic apps, DJ beats and tapping feet, 3D prints and policy advocacy, proud parents and laughter. Photo by William McCann. Despite some earnest research in the earliest phases of our organizing, it wasn't until after the Funk Parade that we discovered that an event model super similar to the one we ended up developing was already in use in communities around the globe (and one that the Open Technology Institute itself has had a lot of involvement with in the past): DiscoTechs (AKA Discovering Technology). 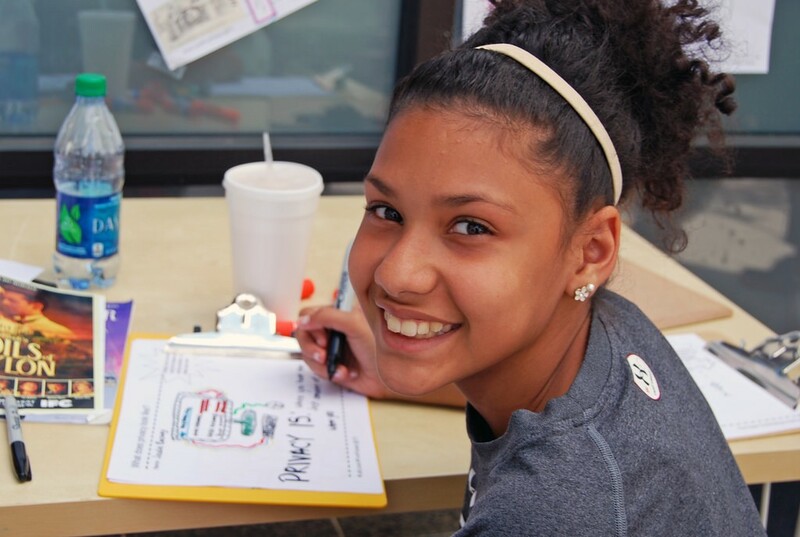 Like The Tech Embassy, DiscoTechs use an open, science fair-like model that meshes a variety of media (from DJs to digital video) with the opportunity to collaboratively learn technology and tech skills. Behind the scenes on the organizing side, there’s a lot in common, too. The morning of The Tech Embassy, volunteers decided to make additional advertising to post around the block. Photo by Maureen McCann. Less is more. Sloppy can be good. The less produced your event feels, the more you ask for help (and can be explicit about what help you need), the more opportunity you give folks to step up to help and take ownership. 2. Distribute leadership. Good organizers play the role of first domino, not head honcho. Organize to create structures that make your role smaller over time by assigning leads to specific tasks or workflows (i.e. greeting visitors, managing the art wall, registration, etc). If the work is discrete, important, and easy-to-pick-up (v. vaguely described or heavy-handed), folks will self-select to take leadership. Let them. Reward those stepping up by being thankful, checking in on how they’re doing every once in a while, giving them the resources they need to rock, and by not micromanaging. 3. Be leaderful: Part two of the above. If you’re doing decentralized leadership right, the workflows that people can lead are things that more than one person understands or can get up to speed with quickly. Once someone is trained up with talking points, they can not only play the role of greeter, they can train others to help or cover for them. Making your team fluid in this way not only can help save you stress, but also adds to the authenticity of the “everyone can” environment. Local music producers give a history of go-go for Tech Embassy visitors who’ve been bopping to the beat all day. Photo by William McCann. 4. Have fun. Seriously. If you and your ever-expanding, leaderful team aren't having fun, no one else will. Put on music. Make messy art. Play games. Start the dance party. Talk to strangers. You might not be the center of attention, but you’re part of the community you’re trying to activate. Be the fun you want to see in the world. In the civic tech space, we talk a lot about “open source”—code made available for anyone’s reuse and remixing, with the knowledge that opening up to the contributions of many can allow for the discovery of problems, patterns, new ideas, and opportunities that one alone might miss. Open format events are like open source social code—rough rubrics that can be “forked” (borrowed and altered) to mobilize people around technology. Dragging and dropping a format for community-building without first evaluating the context in which you’re organizing and who you’re organizing for is a recipe for exclusion and redundancy. The reason we didn't jump into a hackathon at the Funk Parade was because we knew, after evaluating our criteria for a “good” event in that context and the people we wanted to bring together, that a hackathon wasn't the right fit—but that didn't mean that we couldn't do anything technical. It was just a design challenge, prompting us to ask in real terms (not aspirational) what structures we needed to borrow, what attributes we had to re-imagine (and, worst-comes-to-worst, create) that would allow us to bring together the most diverse group of DC-ers possible. User-testing at The Tech Embassy. Photo by Anthea Watson Strong. Diversity is about a lot more than race and gender. It’s about age, class, background, profession, sexuality, neighborhood, World Cup team…the many ways in which people identify and are identified. When we willfully ignore diversity in the design of our technology, our social spaces, and our “community meet-ups”, we trivialize a future where universal technology access is meaningful and dynamic — not just about literally having access to tools. In creating The Tech Embassy, we had the luxury of knowing many of the alternative structures that we could borrow from. But now, you do, too. *Supreme kudos to our partners: Funk Parade, The Curious Citizens Project, Affinity Lab, Code for DC, Code for Progress, DC Public Libraries and Digital Commons, Hamiltonian Gallery, JAM202, GOGORadio, Mapbox, Visual Impact, Open Technology Institute at the New America Foundation, and the Sunlight Foundation.